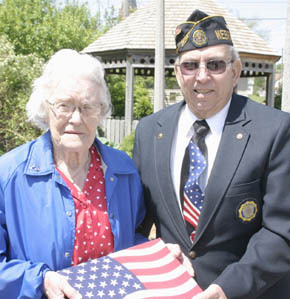 The award is given each Memorial Day to a member of either the American Legion Auxiliary Mandersen Lehr Unit 162 or the Veterans of Foreign Wars Auxiliary to Post 736. Myrna was born Oct. 6, 1921. She attended a local country school and graduated from Albion High School in 1938 as the class salutatorian. At age 16, she began teaching in a country school in the Akron community. She was married on March 20, 1942 in Primrose. During that year, her husband was drafted, and in May 1943, their daughter was born. While her husband served in the military overseas, she taught school. When he returned in 1945, they began farming in the Akron community. Their son was born in October of 1946. She is active in the Akron Presbyterian Church and has served as an Elder, a Sunday School teacher and the Sunday School Superintendent. She has been an active member of the BPI Club for many years. She also helped organize the Bonanza 4-H Club and served as their leader for more than 25 years. In her spare time, she enjoys making quilts. She has played a major role in organizing high school reunions and recently contacted members of the 1938 Albion High School graduating class, encouraging them to attend their 70th reunion. Since moving to Loretto about 25 years ago, she has continued to support the Akron Presbyterian Church and also the Loretto Methodist Church by helping prepare food for their many church dinners. A life member of the VFW Auxiliary, she ably served as their treasurer for many years and supported the organization’s many projects. Myrna (my grandmother) has been a great role model to me for all of my life. She has been a lifelong teacher and wonderful supporter of many different activities. It is great to see her get recognized in the community.